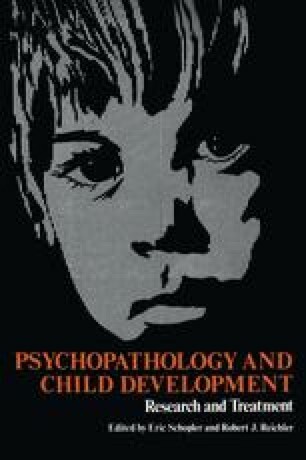 Of all of the many puzzles related to the development of the young child, none seems to be more fascinating or frustrating than the behavior of the child diagnostically labeled “autistic.” One of the authors of this paper recently returned from a tour of special schools for handicapped children in the Soviet Union. In one of these auxiliary schools for the “debile” or educable mentally retarded, he was shown a youngster whom the Soviets identified as schizophrenic, but whom we would designate autistic. This experience was particularly unnerving because the child resembled, to a great degree, autistic children seen in the United States. He did not engage in meaningful social contact; he had a number of stereotyped ritualistic behaviors; he liked his environment to be orderly and in place and got very upset if things were moved around. He talked some, but did not respond verbally to social contact; rather, his verbalizations were self-initiated. The translator told us that she could not understand the words the boy was saying. To see an obviously autistic child in such a different culture is to cause one to be thoughtful about etiology.